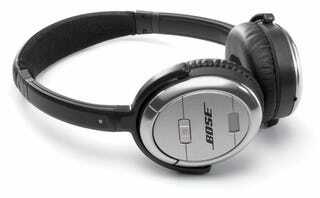 Prepare yourselves for another Battle Royal between the Bose Haterz and the People Who Like Bose. The QC3 Noise-Cancelling headphones are an interesting mix of Bose fidelity and excellent noise-cancelling circuitry. Priced at $349, the headphones are considerably smaller than the QC2 they're replacing. About 3 inches in diameter, they're clad in a nice alloy and have a built-in rechargeable battery and removable audio cable that can double as cellphone headphones. The ear cups are soft and tender, clad in faux leather. Sound quality was quite good. They "simulated" an 85-decibel plane noise and played a little Dave Matthews Band—I know! Can you believe it!—and the bass response was quite impressive for the size. The front end of the audio, aside from nice isolated stereo, was a bit murky but considerably more impressive than any earbuds or even some lesser noise reducers we've used. The noise reduction itself was very impressive. You can even wear them as a pair of earplugs. Overall, during our brief encounter, I would say these headphones are worth the premium price point. The 20-hour rechargeable battery alone is a nice touch and they're a considerable upgrade from the QC2. It drops June 15, 2006.